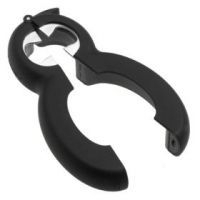 Some of these screw top openers may be suitable for one-handed use, some are multiple purpose and can also be used on bottle tops and can ring pulls. 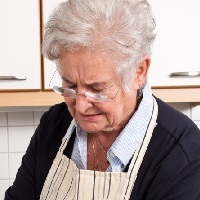 Difficulty opening jars and bottles is common, (Consumer Affairs Directorate Department of Trade and Industry (dti), 2000) particularly among the older population (Shiffman, 1992). Some of these products simply improve your grip, others have an extended handle which gives greater leverage and thus assists with turning. 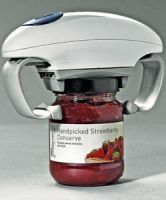 The actual method of gripping the lid with the opener varies so its worth trying a range of models (Disabled Living Foundation, 2006). 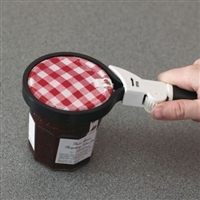 Its worth thinking about the approximate dimensions of the jars you regularly open, some jar openers will only open certain sizes of jar. Most jar and bottle openers require you to hold the jar or bottle with one hand and use the jar or bottle opener in the other hand. 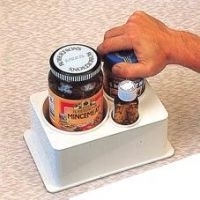 However, it may be helpful to place the jar / bottle onto a slip-resistant mat or jar holder which will help to stop the jar turning so you can concentrate on turning the lid. 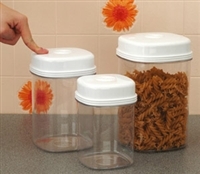 With the jar or bottle stabilised, you could use both hands to grip the lid, this may help if you experience reduced grip, pain, general weakness or tremor. table top jar and bottle holders. 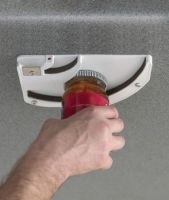 Mounted screw lid openers can be fitted under a high cupboard or worktop and grip the lid of the jar. 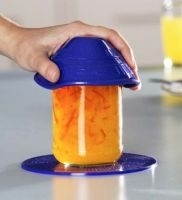 You grip and turn the jar itself which may be easier than gripping a lid. 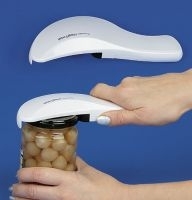 Electric jar openers can open a jar at the touch of a button.